DAYTONA BEACH, Fla. (July 5, 2017) – ATF & Gunslinger was back in the winner’s circle at the Goodwood Festival of Speed on Sunday evening. The 1995 NASCAR Camping World Truck Series Champion once again bettered his record along the 1.16-mile hill climb, this time becoming the first driver to break the 50-second mark in a NASCAR racecar with a 49.02-second run. 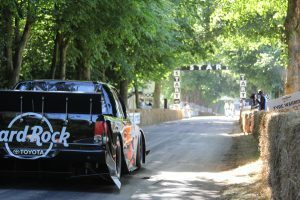 The effort placed Skinner sixth overall in a shootout field of 40 competitors, and helped him secure the prestigious title of “Driver Of The Day” from Lord March for the third time in his eight Goodwood appearances during the 25 years of the event. 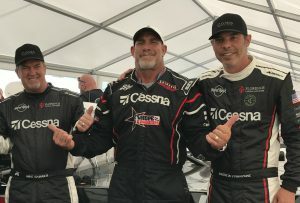 Skinner was joined by teammate Andrew Franzone in his sixth appearance on the hill climb, as well as WWE Champion Bill Goldberg, who was driving in his first Festival of Speed event. The trio was backed by the ATF & Gunslinger team, which is headed by Skinner’s sons Jamie and Dustin. In addition to succeeding in their efforts on the track, the ATF & Gunslinger team also championed their efforts off the track to support our nation’s heroes and their families. The team used the opportunity to raise funds and support for Hope For The Warriors, a national nonprofit focused on restoring self, family and hope for service members, veterans and military families. Through a live auction, dinner event and donations collected throughout the weekend, the group was able to donate $62,500 to support programs designed to assist the post-9/11 military community. Both efforts were supported by a long list of partners, including: Textron Aviation, home to the Cessna brand, Hard Rock International, Caymus Vineyards, Criquet Shirts, Toyota, Triad Racing Technologies, Goodyear and Chin Track Days. As well as returning partners from the financial industry, including Florence Capital, FocusPoint Private Capital, Sentinel Real Estate, Warrington and Start Media.